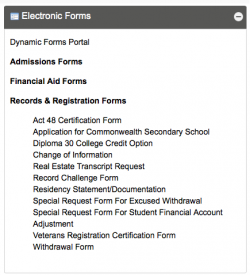 Under the "Student" tab, locate the "Electronic Forms" section block in the right-hand column. Click "Records and Registration Forms" to show available forms. Select the form you wish to fill in. Once all information is correct, "Submit" the form for review. To access these forms, follow the instructions above to log into MyCCP. If you no longer have access to the MyCCP Portal and would like to submit an electronic form, email records@ccp.edu for assistance. A Commonwealth Secondary School Diploma (CSSD) may be issued to a Pennsylvania resident who does not possess a secondary school diploma and who is at least 18 years of age upon presentation of evidence of full matriculation and the satisfactory completion of a minimum of 30 semester hours of study at an accredited institution of postsecondary education located in the United States. An official college transcript is acceptable evidence for award of this diploma. You may use this form to change or correct student demographic information, such as name, address, phone numbers, birth date, social security number, and email address. Proper documentation is required to change name, residency, and correct a social security number discrepancy. For example, if you are registering a name change, legal documentation (e.g., birth certificate or marriage certificate) is required. This is the form to use if you believe an error exists on your academic record. It is not to be used to challenge a grade decision made by your instructor. It takes about 30 working days for the College to research your problem. It is a good idea to check your transcript each semester for accuracy. This form is used to update the residency status on your account. Tuition rates at Community College of Philadelphia are determined by a student's domicile. Domicile is the place where one intends to and does, in fact, permanently reside. Along with this form, at least two documents from the provided list are required to support your request. Please allow 3 business days for request to be reviewed. You will receive notification through your College email account. If you experience a personal emergency situation, or medical problem with complications that caused you to have to withdraw from the College, you may want to apply for an excused withdrawal. It takes about thirty (30) working days for the College to respond to your request. Requests for excused withdrawals will not be considered if supporting documentation (e.g., medical or court documents, death certificate, etc.) is not included. Occurrences of more than 2 years are not considered. However, you may want to consider the possibility of time or academic amnesty in these circumstances. This form is used to request an account adjustment for courses that were dropped because of extenuating circumstances reasonably beyond the control of the student that caused the student to be unable to attend classes or complete the semester/term. These circumstances may include: extenuating medical complications, or personal emergency or situation, such as death of a close relative. This request must be accompanied by supporting documentation that provides an appropriate reason, pertinent dates/period of time, and submitted on official letterhead or office stationary. Examples of supporting documentation: letter from physician, court documents. death certificate, etc. Requests will not be considered if incomplete or supporting documentation is not included. Time Frame: Your request must be submitted by July 31st of the academic year in which the incident that initiated your request occurred. (e.g. incident occurred on September 20, 2010, request must be submitted no later than July 21, 2011). Veterans must complete this form each semester for the College to certify enrollment, which is a requirement for receiving veterans' benefits. To expedite processing, complete this form at least two weeks before the beginning of each semester. Use this form to request your transcript in-person or by mail. For faster service, you can also order your transcript online. If you no longer have access to the MyCCP Portal and would like to submit an electronic form email records@ccp.edu for assistance.